Recruit Class 4 is set to graduate this Friday, November 6, 2015. As part of their continued learning in the 16-week academy, the training staff allows them to participate in service opportunities around the community. The recruits have helped provide food service at the Catholic Multicultural Center, assisted with a neighborhood pancake breakfast, donated blood during blood drives, and worked with student athletes. 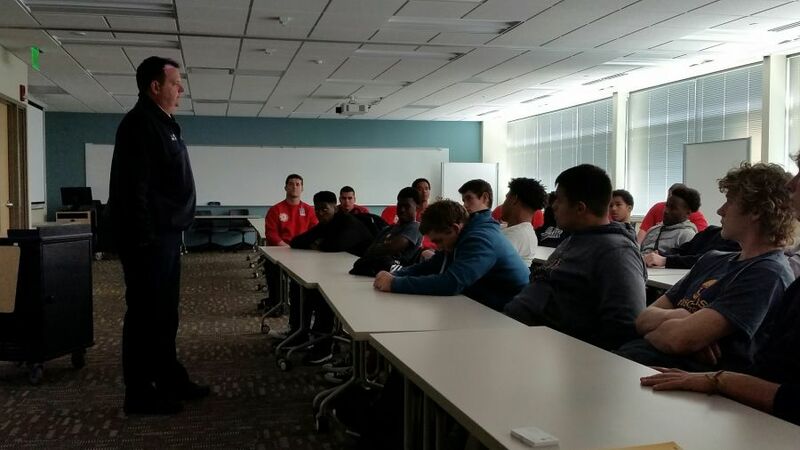 Last Monday, I had the honor of assisting with the LEAD (Leadership, Excellence and Achievement Development) program, a non-credit course created for high school sophomore and junior athletes at East High School. The program was developed to raise class attendance and grades while decreasing disciplinary referrals. It’s intended to help those who are leaders on the field or on the court to become leaders in the classroom by making good choices in life as they grow and develop. The recruit class invited me to come in and discuss the critical values each person needs to become a good community member-- and a good firefighter should they choose this profession someday. I also discussed leadership, followership, and practicing good judgment in life, in and out of the classroom, on and off the field or court. I had the fortune of spending about an hour with the group, and the recruit class spent the next two hours showing the students what firefighting and EMS work is all about. Each recruit worked with two students. The recruit put the students through some of their daily learning routine, which includes rappelling, fire hose work, ladder work, and rescue work. At the end of the day we put the student athletes through one of the MFD fitness workouts. By all accounts, this was a very successful day. The student athletes were exposed to everyday leaders who taught them the importance of giving back to a community.